I’m thinking about siblings today. This photo above was the first time in many years that just the six of us were together. We were laying to rest our mom’s ashes who had passed away on Mother’s Day night 2009. It took us four years to find her final resting place in the small town where we grew up and where we feel she was the happiest. I love this picture because it resembles one from 1962 when our mother and her siblings all were photographed at her father’s funeral. Though, both are at funerals of a parent, the similarities of the two are striking. You have the smilers in front Aunt Kay and Aunt Margie, and over to the left Aunt Evelyn is trying to suppress her smile, Uncle Jim smiling. 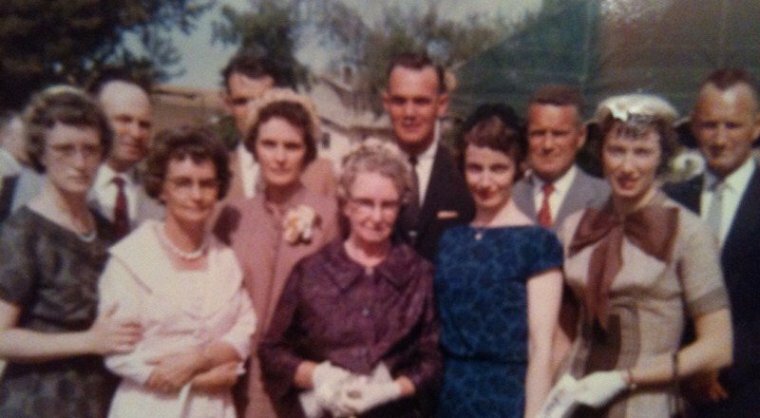 Our mother is in the rose-colored coat obscuring my Uncle Elwon. Love vintage photos of families.